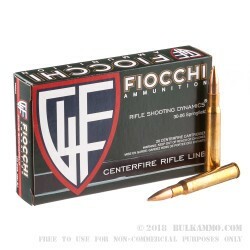 With its premium components including precision formed brass cases, non-corrosive and uniform primers, and clean and consistent burning powders, Fiocchi's Rifle Shooting Dynamics line of ammunition is the perfect way to get the most out of a day at the range -- but without having to pay a premium price in exchange. 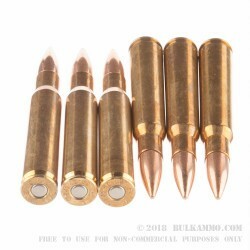 This 30-06 Spring cartridge has a 150 grain projectile, which is in the lighter range of bullets that are commonly commercially available for this caliber. The bullet sports a full metal jacket, so it will penetrate beautifully with the added benefit of keeping your bore free of lead fouling. The bullet also has a boat tail shape, which stabilizes its flight path for better accuracy and a higher ballistic coefficient. This cartridge also offers a factory fresh brass casing, which with its Boxer primer is perfect for handloading. 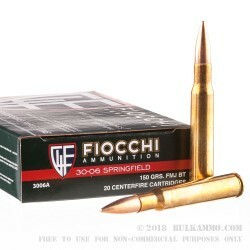 One of Italy's largest and oldest ammunition manufacturers, Fiocchi owes their over fourteen decades in business to the sound quality of your ammunition. That excellence will display itself every time you shoot this hard-working 30-06 Spring round!